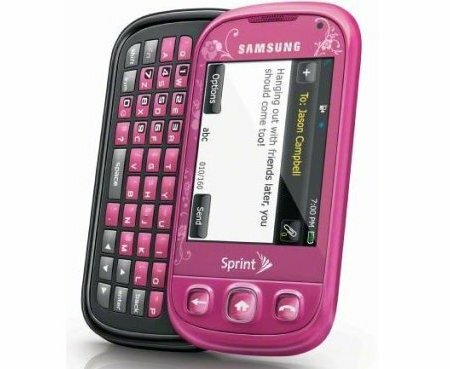 Sprint has announced a brand new cellphone for the masses Stateside, where you will be able to pick yet another touchscreen device that also sports a full slide out QWERTY keyboard if you’re a messaging and email fiend – we’re talking about the the Samsung Seek, also known as the Samsung M350 if model numbers are your cup of tea. This 3G phone will come in a trio of color options alongside an easy-to-use, customizable menu system that provides instant access to their favorite features and applications. Basically, this is a phone that aims to bring the best of messaging features as well as multimedia favorites in a compact and stylish design, where you can choose from Cool Blue and Scarlet Red colors for a mere $29.99, with of course, the now customary new two-year service agreement and this also after a $50 mail-in rebate. For those who can wait until June 6th, you will then be able to pick it up in Fantasy Pink. Apart from being a pretty decent smartphone on paper with 3G connectivity, Samsung and Sprint also have a heart for the environment so those who love the earth will be able to take part in a new recycling solution whenever they pick up the Samsung Seek. How does this green initiative work? Well, customers can easily reuse the packaging to ship old wireless phones, batteries, accessories and data cards with a postage-paid paper mailing label. Basically, this menas you can use the label and box which comes with your phone inside to repackage your old equipment for recycling in under a minute without costing you a single penny more. Sprint will then go ahead to recycle both the equipment and the box. Folks who pick up the Scarlet Red Samsung Seek instead will find the traditional postage-paid envelope made of LDPE #4 recyclable plastic. Other elements used to package the Samsung Seek include paper-based solutions for the inner tray, bags for literature and the battery, and mailing envelope. There is at least 90% post-consumer waste (PCW) paper fiber which is 100% recyclable in the box and inner tray, where all of it hails from sustainable forests. Top sheets and liners are chlorine-free, printed with soy inks, and have a water-based aqueous coating. Go green while getting a new phone – we hope to see other companies take up similar initiatives as we only have one earth, borrowing it from our kids.